One of the things I like about Europe is being able to travel by train. And given the train situation in California, I’m always surprised by how good they are here. I took the picture on the right a couple of weeks ago on the return leg of a visit to CERN, just outside of Geneva. 296 kilometers per hour is about 184 mph. The fast trains here are called TGVs. One of my big disappointments here, however, was when I finally found out what TGV stood for. Technologically Great Vision? Totally Groovy Vehicle? Nope. 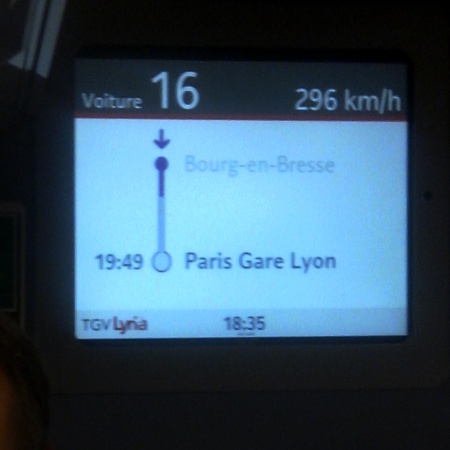 “Train a Grande Vitesse” — basically, “High Speed Train”. Yawn. This was probably taken on my way home from work as well. 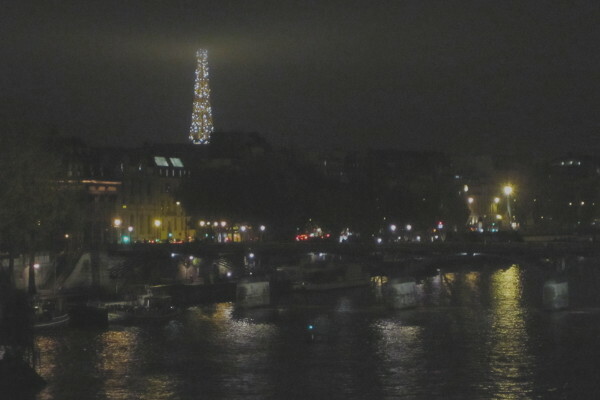 It looks like it’s from the bridge right next to the Place Chatelet. I took this walking home from work a couple of nights ago. 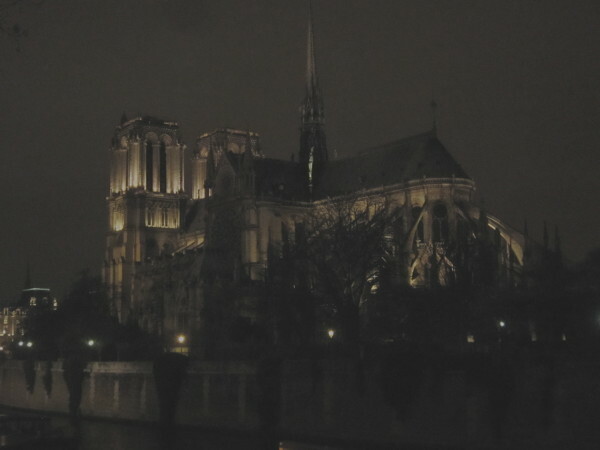 My preferred route takes me just past the back end of Notre Dame. So, this isn’t the greatest shot in the world, but I won’t apologize, since I took it on a tram with my cell phone. I’ve noticed this place for the last year or so when I’ve been taking the tram — I’ve never been by here on foot. 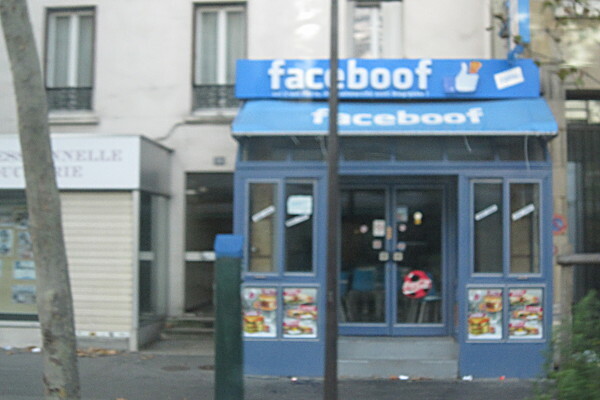 The name is obviously a play on Facebook, and I think it’s a restaurant, the ‘boof’ standing in for ‘bouffe’, which is sort of like ‘chow’ or ‘grub’ in French slang. I’m not sure I would name my restaurant after an online play on words… (but I did blog about it…). Today on my way to the metro station I saw a crowd of people outside a “House of Hoops” store. They sell sports shoes. It was between 8 and 8:30 am, and there weren’t crowds outside any of the other shops around. Posted on 2014-11-28 2015-09-14 Categories An American in Paris1 Comment on Black Friday? 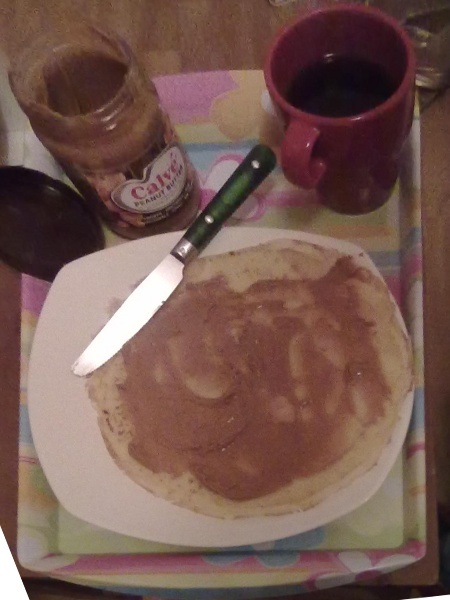 Here’re the real two great tastes that go great together — I got peanut-butter crèpes with coffee in bed for breakfast today. Posted on 2011-11-02 2015-09-19 Categories An American in ParisLeave a comment on Peanut-Butter Crepes? Most Parisians try to escape Paris during the summer, but many can’t. The city makes an effort to make it a bit vacation-like for us poor souls trapped here. 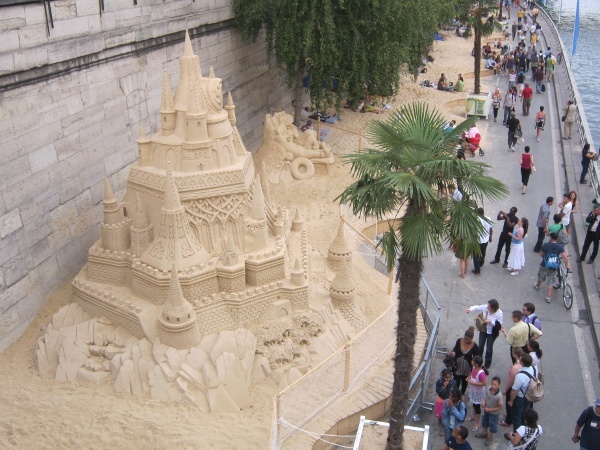 Every year they ship in tons of sand and put it next to the river Siene and call it Paris-Plage (the Paris beach). 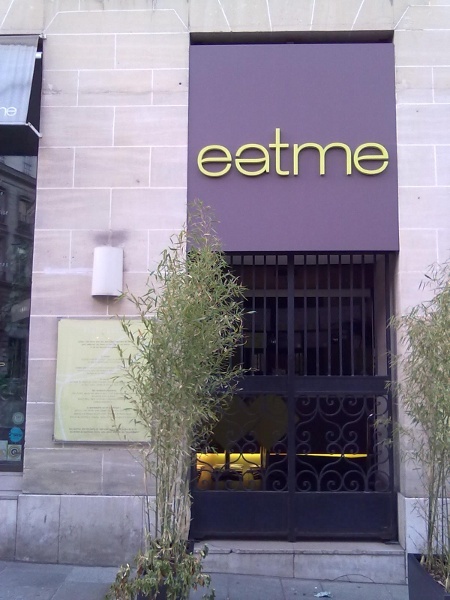 … but what should I think when I see a restaurant with this name? 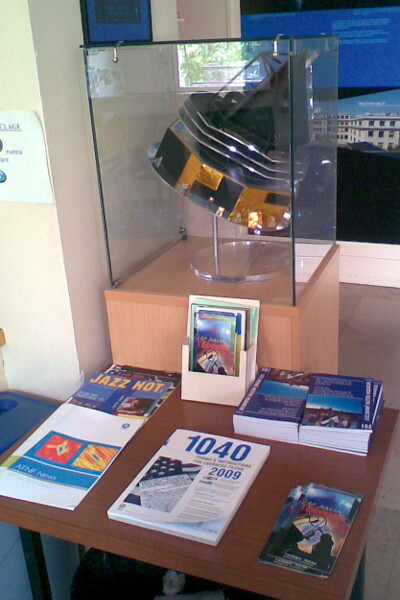 I was a bit surprised to walk into the Institut d’Astrophysique de Paris one days and find, along with a bunch of brochures and other stuff you might expect to find at the entrance to a French astronomy department, the instruction for the 2009 US 1040 tax form. That’s a scale-model of the Planck satellite in the background. Posted on 2010-06-17 2017-11-05 Categories An American in ParisLeave a comment on Astro 1040? I got far too excited when I saw this in the bakery near my apartment. At first I didn’t realize what the little sign said. 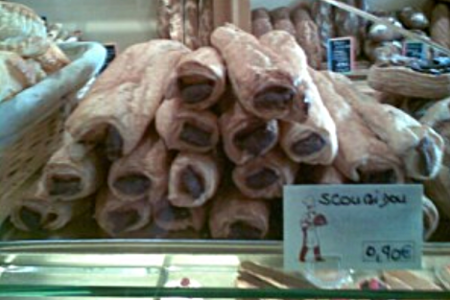 As I started sounding it out… scoo…bee…doo, I realized that these are the Parisian equivalent of Scooby snacks! Posted on 2009-12-31 2015-09-14 Categories An American in ParisLeave a comment on Scooby-Doo is right here!